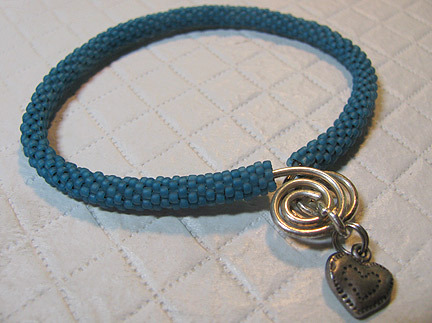 I used brick stitch for my bracelet because I liked being able to work the stitches right around the wire armature. Other good choices would be RAW, tubular peyote, or even flat peyote which you would then zip up around the wire. 1. Form a piece of 16 or 18 gauge wire into a cuff shape large enough to slip on and off your wrist. Curl up the ends into spirals facing in opposite directions. 2. Use jump rings or split rings to fasten the spirals together and to add a charm. 3. Bead weave around your wire.